Design your own set of coasters showcasing your fondest memories. 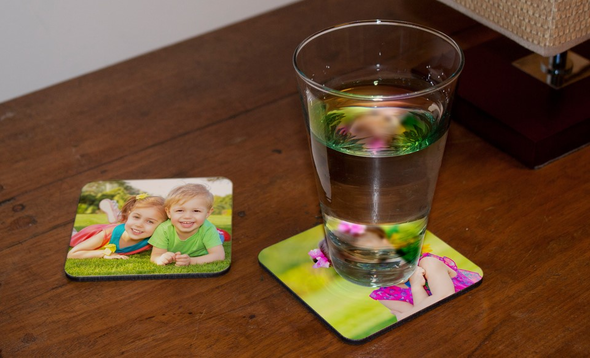 Our photo coasters are not only practical for protecting your furniture from unsightly water rings, but are a great way to display your photos to share them with family and houseguests alike. Simply select your photos and pick from a wide variety of templates to accent your treasured memories! With so many templates to choose from, you can easily create a coaster that will look great displayed anywhere, from your coffee table to your kitchen counter. MailPix coasters have full photo layouts and several stylish backgrounds, so there’s something for everyone! Set your drink down in style while relaxing at home with the family or pass out your photo coasters to guests at your next dinner party. Whether you’re coasters are showing off your wedding photos or candid family snapshots, they’re sure to be quite the conversation starter! If you’re looking for a unique gift, our personalized coaster set will not disappoint. Whether it’s Mom’s birthday or a friend’s housewarming, you can create a coaster set with their favorite photos featured on one of our many styles templates. Not only practical, our coaster sets are a great way to add interest to your loved one’s dining décor and are a perfect accessory for entertaining! Furthermore, we offer other custom photo products so you can create a unique gift set! Our coasters pair perfectly, with personalized photo mugs and our custom placemats. Brighten up Grandma’s dining table with photos or create a fun, personalized houswarming gift for your best friend’s new apartment. Use your loved one’s photos and create something special just for them today!